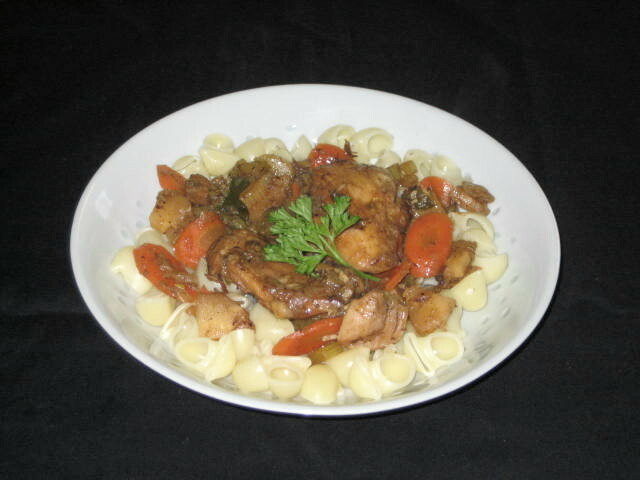 I was hesitating what to call this meal that I have made with skinless-boneless chicken thighs, root vegetables and served over pasta. I had to come up with a meal whose main ingredient was chicken thighs. It was a case of checking what else is in pantry and vegie drawer in refrigerator. I didn’t want potatoes as a side and I didn’t feel for tomato based sauce either but wine based sauce sounded great. For vegetables, I picked carrot, celery, parsnip, shallots and garlic and as a side I wanted some dry pasta shapes. Coq au vin usually starts with rendering salted pork. I didn’t have any but I had bacon which I did use. The idea was to render the bacon, remove the crispy bits and use them as a garnish at the end. That was a plan, anyway. The problem was that this beautiful, crispy bacon was sitting next to the stove and every time I went by the stove, which was often, I had a nibble. Half way through cooking there were no bacon bits left for garnish. Next time I will hide the bacon in toaster oven. Even though only seasoning I used was salt and pepper the sauce has incredible depth from the vegetables and wine. I used Chardonnay. This recipe is for 2 people using only 2 chicken thighs. 2 skinless and boneless chicken thighs, fat removed and seasoned with pepper and salt. In sauce pan, render the bacon until crisp, remove the bits to paper towel and pour off bacon fat leaving only 1 tsp. Save the extra bacon fat for other use. Brown the chicken thighs on all sides, remove and keep warm while you cook the vegetables. In the same pan cook onions and mushrooms until they start to brown and then add all the vegetables and sauté until they start to caramelize. Pour in a cup of wine and scrape all fond (food that browned and stuck to pan) from the bottom. Put the chicken back in pan and simmer until almost all the wine has reduced. Add remaining 1 cup of wine and keep simmering until sauce is thick, about 30 minutes. Just before serving add ice cold butter to the sauce, stir till all the butter is absorbed by the sauce, then cook for 3 minutes. Serve over cooked pasta and garnish with reserved bacon bits.